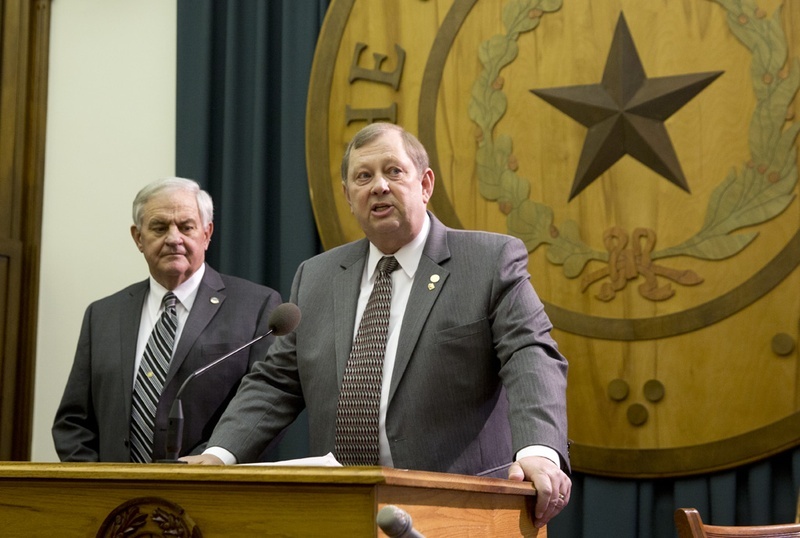 State Rep. John Otto (right) proposes a constitutional amendment to use Rainy Day Fund money to pay off state debt during a news conference on Jan. 15, 2015. At left is state Rep. Jimmie Don Aycock, R-Killeen. Following five weeks of hearings, House budget writers put the final touches Thursday on a two-year budget plan that could sharpen the debate with Senate leaders on how to boost money for transportation. Appropriations Chairman John Otto, R-Dayton, said the House budget adds $1.5 billion to transportation funding from general revenue, the portion of the budget lawmakers have the most control over. The funding approach contrasts with the Senate, where Transportation Chairman Robert Nichols, R-Jacksonville, has championed a plan to put more money toward road construction and maintenance by amending the state Constitution to dedicate some of the sales tax collected on vehicle sales to roads. Gov. Greg Abbott made Nichols’ idea a feature of his election campaign last year, though critics have questioned whether it would tie the hands of future legislatures. Both the House and Senate budgets also boost transportation funding by undoing $1.2 billion in spending that currently is paid out of the gas tax but is not directly related to transportation. School funding levels did not change from the base budget, which added $2.2 billion to public education on top of funding enrollment growth, Otto said. The House budget does not include any tax relief measures, as plans for various proposals will go through the Ways and Means Committee. In the Senate, Finance Chairwoman Jane Nelson, R-Flower Mound, allocated $4 billion in that chamber’s budget for property and business tax cuts, but she has said the Senate would probably spend more on tax relief. Otto predicted that the 27-member Appropriations Committee would vote out its budget plan in about a week, and that the full House would debate the measure just before Easter. He said the Legislative Budget Board was still calculating how much the budget has grown compared with the $202.4 billion base budget Speaker Joe Straus released in January. Among the changes from the base budget, Otto said he was particularly proud of $276 million going to fund a 10 percent pay raise for the state’s correctional officers. Budget writers were interested in offering “a salary that’s competitive enough to fill some vacancies of our correctional officers and honoring the work that they do,” he said. The House budget also includes a $440 million plan to shore up the state’s public retirement system’s funding. Under the plan, state workers will receive an across-the-board 2.5 percent pay raise to offset the extra money they will be required to contribute to the Employees Retirement System pension fund.